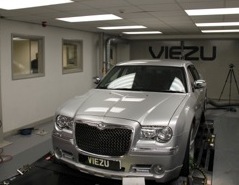 Wow – what a fab day today tuning Chrysler 300C’s, how often can you boost a cars performance by 30%! And not affect fuel economy or reliability Today we were joined by Tim, Miles, Simon, Rocco and Paul, from the 300c owners club, seriously nice guys and seriously tuneable cars. Now if honest, many are in two minds about the Chrysler 300c, it looks nice, but is it the real deal or a USA muscle car wanabe with no teeth? If you are s sceptic hold that thought, once you really get up close and take a good look the 300c is a pretty serious beast, you instantly start to understand why they have such a following. What is immediately obvious is the 300c has real presents, it simply dominates our dyno room once loaded, and through strapped down with 6 x 15 ton industrial straps, as the power starts to load up, the room turns electric, for the first time in a very long time we find ourselves double checking the straps and mountings, thoughts of King Kong breaking loose spring to mind, and thats because quite simply – it’s a bit of an animal.